We collect two types of information during your visits to our Site. First, we collect non-personally identifiable information. When visitors come to our Site, we collect and aggregate information indicating, among other things, which pages of the Site were visited, the order in which they were visited and which links were ‘clicked.’ Collecting such information involves logging the IP addresses, operating system and browser software used by each visitor to the Site. We also may use ‘cookies’ and other tracking technologies to collect non-personally identifiable information regarding you. Second, we collect personally identifiable information when an order is placed through Paypal. We use non-personally identifiable information, such as your IP address and the pages that you visit on our Site, to administer our Site and improve Site-related services and features. We use personally identifiable information collected from you to complete transactions initiated by you (such as the sale and delivery of products and services). Your personally identifiable information is also used to get in touch with you when necessary. We will not share your email address with other companies. While we seek to protect your personally identifiable information, we cannot guarantee the security of any information provided to us or to any third party through or in connection with the Site. You provide all such information at your own risk. 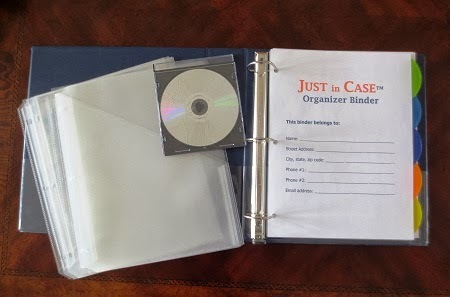 Just in Case™ binders make perfect gifts for family members, friends, or special business clients! Who do you know who could benefit from the gift of Organization and Peace of Mind? 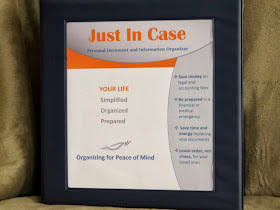 The Just in Case Personal Document Organizer Binder System is an administrative, personal record-keeping resource and is intended for use only as one of many informational and education resources on the topics discussed. The book, forms and suggested topics make no written or oral representations or warranties of any kind. This information is not intended, nor should it be interpreted as, providing professional medical, legal, tax or financial advice. You should consult a trained professional to address any specific questions related to these areas. Copyright © 2013-2014. All Rights Reserved . Powered by Blogger.